Get ready to hide behind the couch or be exterminated! The new Inflatable Dalek has landed! This awesome large inflatable Dalek is the ultimate gift for Doctor Who fans that can't wait to get their hands on everything from the popular BBC science fiction TV show. 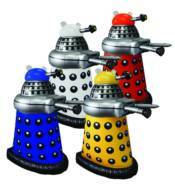 Perfect for all collectors of Doctor Who paraphernalia and the ultimate addition to kids bedrooms. Approximate size: 30 x 23 x 4 inches. Ages 5 +. Available in red, blue, yellow and white.